Pansy or garden pansy is the common name for diverse cultivated plants raised for their flowers, Viola tricolor hortensis or Viola x wittrockiana, characterized by five, almost heart-shaped, overlapping petals and a wide diversity of possible colors (yellow, blue, red, orange, white, etc. ), including bicolored flowers. The name pansy also is applied to many other plants in the Viola genus of the violet family (Violaceae), such as the yellow pansy (Viola pedunculata), field pansy (Viola arvensis), and wild pansy (Viola tricolor, also known as the heartsease), the later of which is believed to be the species from which the garden pansy is derived. 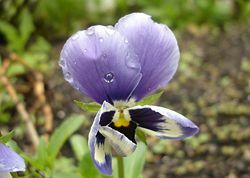 This article, however, will be limited to discussion of the garden pansy, which may be referred to by a subspecies name, V. t. hortensis, or as a hybrid, Viola x wittrockiana. Ecologically, pansies provide food for both herbivorous and pollinating insects. They also are edible for human use, and the parent plant, heartsease, has been widely used in herbalism for a variety of medicinal uses, such as a treatment for asthma, epilepsy, skin diseases, and eczema. However, the main use of the garden pansy is ornamental, being grown for the aesthetic appeal of their velvety and strikingly colorful flowers. Pansies are one of the most popular and well-known cool weather flowers. Pansies are members of the Viola genus, a taxon of flowering plants in the violet family Violaceae, with around 400–500 species distributed around the world. Viola species, which commonly are called violets, pansies, or heartsease, tend to be small perennial plants, although some are annual plants, and a few are small shrubs. Viola species typically have heart-shaped, scalloped leaves, though a number have palmate leaves or other shapes. Plants always have leaves with stipules that are often leaf-like. The flowers are formed from five petals; four are upswept or fan-shaped petals with two per side, and there is one broad, lobed lower petal pointing downward. The shape of the petals and placement defines many species. Solitary flowers are produced on long stalks with a pair of bracteoles, and have 5 sepals that remain persistent after blooming, although the sepals sometimes enlarge after blooming. The flowers have five free stamens with short filaments that are oppressed against the ovary, with only the lower two stamens having nectary spurs that are inserted on the lowest petal into the spur or pouch. Viola flowers are most often spring blooming with chasmogamous flowers with well developed petals pollinated by insects. Many species also produce self-pollinated cleistogamous flowers in summer and autumn that do not open and lack petals (Walters and Keil 1996). The nutlike seeds have straight embryos, flat cotyledons, and soft fleshy endosperm that is oily (Cronquist 1981). The seeds are often spread by ants. 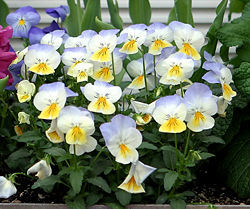 The pansy or garden pansy is any of the diverse cultivate flowers considered to be derived from the wild pansy or heartseas (Vila tricolor, also known as Johnny jump up) and often given the subspecies name, Viola tricolor hortensis, but often are hybrids and are referred to as Viola x wittrockiana. Plants grow up to nine inches (23 centimeters) tall, and the flowers are two to three inches (about 6 centimeters) in diameter, though there are some smaller and larger flowering cultivars available too. The various cultivars are biennials or short-lived perennials, but with the flowers and seeds appearing in the second year of growth (Salazar). 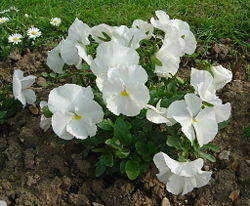 In general, pansies are hardy plants. 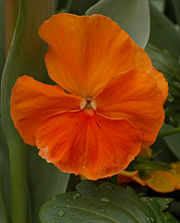 The pansy has two top petals overlapping slightly, two side petals, and a single bottom petal with a slight indentation, as well as beards where the three lower petals join the center of the flower. The flowers come in a wide assortment of colors, including gold, orange, blue, a dark blue close to black, purple, violet, yellow, white, red, and brown, and some have dark blotch in middle. A large number of bi-colored flowers have also been produced. More than 250 cultivars of pansies have been developed, such as "Majestic Giant," "Imperial," "Universal," "Crystal Bowl," "Bingo," and "Karma" (Salazar). The name pansy is derived from the French word pensée, meaning "thought," and was so named because the flower resembles a human face; in August it nods forward as if deep in thought (Salazar). Pansies are generally very cold hardy plants, surviving freezing even during their blooming period. Plants grow well in sunny or partially sunny positions in well draining soils. 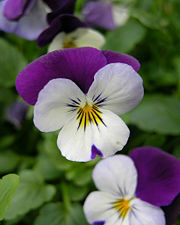 Pansies are developed from viola species that are normally biennials with a two-year life cycle. The first year plant produce greenery and then bear flowers and seeds their second year of growth and afterward die like annuals. Because of selective human breeding, most garden pansies bloom the first year, some in as little as nine weeks after sowing. Most biennials are purchased as packs of young plants and planted directly into the garden soil. Under favorable conditions, pansies can often be grown as perennial plants, but are generally treated as annuals or biennial plants because after a few years of growth the stems become long and scraggly. Pansies are winter hardy in zones 4-8. They can survive light freezes and short periods of snow cover, in areas with prolonged snow cover, they survive best with a covering of a dry winter mulch. In warmer climates, zones 9-11, pansies can bloom over the winter, and are often planted in the fall. In these climates, pansies have been known to reseed themselves and come back the next year. Pansies are not very heat-tolerant; they are best used as a cool season planting, warm temperatures inhibit blooming and hot muggy air causes rot and death. In colder zones, pansies may not persist without snow cover or protection (mulch) from the extreme cold. Pansies should be watered thoroughly about once a week, depending on climate and rainfall. To maximize blooming, plant food should be used about every other week, according to the plant food directions. Regular deadheading can extend the blooming period. Mildew (Oidium) is a fungal infection. Symptoms include violet-gray powder on fringes and underside of leaves. It is caused by stagnant air and can be limited but not necessarily eliminated by spraying (especially leaf undersides). Cucumber mosaic virus is transmitted by aphids. Pansies with the virus have fine yellow veining on young leaves, stunted growth. and anomalous flowers. The virus can lay dormant, affect the entire plant and be passed to next generations and to other species. Prevention is key: purchases should consist entirely of healthy plants, and pH-balanced soil should be used which is neither too damp nor too dry. The soil should have balanced amounts of nitrogen, phosphate, and potash. Other diseases that may weaken the plant should be eliminated. Slugs and snails. To ward off slugs and snails, sharp, gritty sand can be laid, or the soil can be top-dressed with chipped bark. The area should be kept clean of leaves and foreign matter, and so on. Beer in little bowls buried to the rims in the flower beds will also keep slugs and snails at bay. Aphids. To combat aphids, which spread the cucumber mosaic virus, the treatment is to spray with diluted soft soap (2 ounces per gallon). Cronquist, A. 1981. An Integrated System of Classification of Flowering Plants. New York: Columbia University Press. ISBN 0231038801. Iannotti, M. n.d. Pansies: Growing a cool weather favorite. Gardening.about.com. Retrieved November 8, 2008. Rimkiene, S., O. Ragazinskiene, and N. Savickiene. 2003. The cumulation of wild pansy (Viola tricolor L.) accessions: The possibility of species preservation and usage in medicine. Medicina-(Kaunas) 39(4): 411-6. Retrieved November 8, 2008. Salazar, E. n.d. Pansy flowers. PansyFlowers.com. Retrieved November 8, 2008. Walters, D. R., and D. J. Keil. 1996. Vascular Plant Taxonomy. Dubuque, Iowa: Kendall/Hunt. ISBN 0787221082. Wang, J., and M. Z. Bao. 2005. Characterisation of genetic relationships in pansy (Viola wittrockiana) inbred lines using morphological traits and RAPD markers. Journal of Horticultural Science & Biotechnology 80(5): 537-542. Retrieved November 8, 2008. This page was last modified on 21 November 2008, at 17:35.